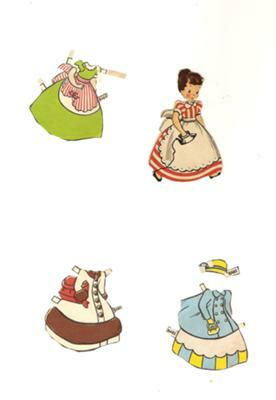 Hi folks, these paper dolls belonged to my older sister by eight years. I then got to play with them in the 1950's. One is carrying a tray of food, one has a phone, one is embroidering, one is drying dishes. I was hoping someone else has some knowledge of them. My plan is to cross stitch the doll and clothes. But so far all I have done is scan them into my computer and printed Amy out on magnetic paper and put her on my refrigerator. That was a lot of fun.